Currently at Station One Coffeehouse. ​The art show at Station One Coffeehouse has been extended an additional two weeks: until November 14th. Please stop by the cafe and enjoy the art on the walls, while sipping a nice warm coffee on a chilly day. If you have any questions regarding any artwork, please don't hesitate to ask the staff at Station One or pop me off an email at skye.jarvis@gmail.com. Station One Art Show Extended. ​If you haven't already had a chance to stop by Station One Coffeehouse, then treat yourself to a coffee and desert, while enjoying the artwork. The art show has been extended until the end of October. A 5 hour trip north landed me in place where time slowed down and I was able to breath in all the beauty around me. During the quiet moments of the day, I worked on this little drawing. I observed the changing landscape as the daylight travelled across the sky, creating new reflections on the water and new shadows on the hills. I thought of the Group of Seven and their paintings of Northern Canada and I thought about how lucky I am to live in such a beautiful place. On our journey through challenging times, we have the ability to grow and create. 'Perseverance'. 2015. Oil on canvas. 15" x 36"
While I was exploring the internet, I stumbled across this interesting read found on the 'Canada Council for the Arts' website, which describes in percentages the way Canadians engage in the arts. We have a decent sized wall in my house and I was having trouble deciding which painting to hang... they all seemed to get 'lost' on the wall. 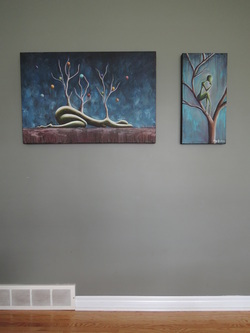 I had placed these two paintings on the floor up against the wall and realized they should be hung together. After a unanimous two thumbs up from the members of my household, the paintings were hung. Art doesn't always have to be hung individually on a wall, you can group them together and have it look great. I pass by this darling little bird house everyday when I take my pup for a walk - I always stop to look at it. It's looking cold and lonely these days. 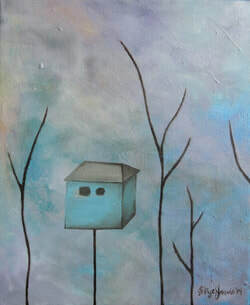 Nothing but leafless branches and a chilly sky to keep this little home company. I've been in creation-hibernation over the past few years. Life took over and many wonderful experience took place - a move in 2012 and a new baby in 2013. As you can imagine, I've had many demands on my time and energy. Today I could feel the warmth of the sun shinning down on my face for the first time in months. The sun must have filled my soul because I had an intense desire to paint - to create. I'm usually too distracted with the goings-on in my house to think about painting, but I came home, put the baby down for a nap, set up a small studio in my basement and primed a canvas. It's been years since I've sat down with a paintbrush in my hand, but I think the time has come to make it a priority again. 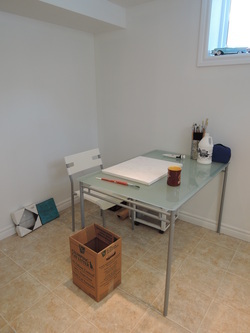 This space will eventually be a full fledged art studio, but in the meantime a table and chair is all I need. I'm excited and a bit nervous to see where I go this time. Creating this painting was an amazing experience and I couldn't be happier with the end result. I was recently at a beautiful cottage up near Bancroft on Trout Lake. 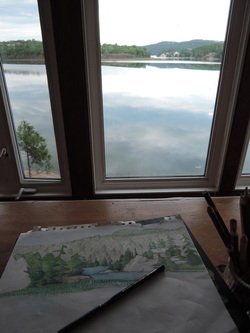 While I was doing a sketch of the lake, five Canadian geese flew by and landed in the water. It was one of those really wonderful cottage moments you can't get in the city. 'Trout Lake'. 2011. Pencil, 8" x 10"